Are You Prepared to Deliver a Sales Proposal? Many years ago, I was sitting in on a sales training session for new hires who were learning the selling method my then employer used. Like many of the selling processes utilised during that era, this one featured a step-by-step process to guide the rep from initial introduction all the way to presenting a proposal and closing the deal. The training session was in a role-playing format with the sales rep interacting with a “customer” during a sales call roughly half way through the selling cycle. The trainee was somewhat intimidated, but they were doing their best—stammering a bit and lacking the confidence that only comes with experience. The rep is thoroughly confused at that point and informs the customer that steps five and six must be completed before a sales proposal could be presented. The fact is, the rep was right. He was not prepared to deliver a sales proposal. As strange as the scenario seemed at the time, it is in fact much closer to the realty of selling today than the elaborate process being taught in the training session. Sales or buying cycles have changed of late. They don’t proceed in some undeviating, linear progression; they aren’t under the tight control of a well-schooled master account executive; and they rarely closely follow a predictable, tried-and-true path as required by some methodology. Much of what sales reps used to do, prospects now do for themselves. If they are evaluating vendors, they can access customer reviews, SEC filings and news accounts related to the company. The same is true of specific products. Prospects self-educate, research, compare and investigate all without bothering to call on a sales rep. Even in transactions initiated by sales personnel, the prospect is still going to run some Google searches, call some existing customers listed on the vendor homepage and do their homework before signing off on anything. This has great impact on the readiness requirement placed upon Sales. The call for a sales proposal can come almost at any time, even over the phone during an initial call. You have to be ready to answer that call. Even in cases where you know the request is not the final hurdle, perhaps more of a price check, you still have to credibly respond. Sales should have access to numerous systems—internal and external—that can supply the basic data necessary to build a sales proposal pretty much on-demand. The key to this process is the CPQ system. What is CPQ? CPQ is the technology the rep uses to configure products in response to specific needs as specified by prospects. 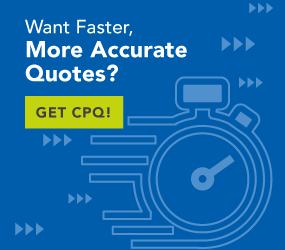 CPQ also maintains a pricing feature that rolls up part and assembly prices and populates that information along with product descriptions on quote sheets for the product being configured. This information is retrievable and is associated with the prospect’s company name. The prospect information is maintained in CRM systems. These systems keep information about locations, business type, financials, contacts and other information for prospects. Marketing automation systems also contribute to this with user stories and collateral that may be relevant to a specific proposal. All of this information can be tied to a specific proposal number along with data extracted and integrated into a proposal. There are assorted levels of sophistication associated with the integration of these systems. The process can be manual or substantially automated. The point is, the rep is not scrambling around trying to figure out where to find information and how to use it in the document. Each proposal is documented, stored and tracked. The sales rep is now equipped to essentially create a proposal on demand that meets the customer’s needs and protects the company from sharing inaccurate information. The proposal may be expanded and modified in the future. The proposal history is maintained to provide a record of what was quoted and why over time. There should be no “what were we thinking” moments in the future.